As I've mentioned before, I'm pretty loyal to use my Paula's Choice cleanser at night - I have found that it's the perfect cleanser for removing my coconut oil make-up remover and cleaning my face without drying it out. I never had a good option for the morning though, so when Glossier came out with "the world's best cleanser" I kind of felt I had to try it! This is the ultimate daily face wash: use on dry skin to dissolve away makeup and grime, or on wet skin as you start your day. The pH-balanced, creamy gel formula is made with a blend of five skin conditioners so your face is left feeling healthy and soft, never tight. Its cleansing power comes from the same gentle cleaning agents you’d find in contact lens solution, so it’s tough on impurities and still safe to use on your eyes. Although it's marketed toward both AM and PM cleansing, I use it in the morning. I wet my face, use one squirt of cleanser, and...wash my face. Groundbreaking! I have used it on days I wear minimal makeup to remove my makeup, and to remove my make-up I use one squirt on dry skin on my eyes, and then will use another half a squirt once my face is wet. I have never had a cleanser actually completely remove my eye makeup, so I was pleasantly surprised when it actually did remove it without irritating my eyes! That was definitely a big plus for me, and will be a big reason why I will take this with me when I travel for rotations. The cleanser has poloxamer in it, which apparently is the same cleaning product used in contact solution, so it makes sense that it is not irritating to the eyes. It has rosewater in it, so it's both soothing and also has a really pleasant soft rose smell. The biggest thing for me is that really is gentle on my skin. My skin feels soft and clean without being super squeaky and dried out. Using it in the morning makes it that I start my day (and makeup!) with a clean and moisturized face. I have tried the Cetaphil cleanser, as it has a similar consistency, but I always felt like it left a layer of film on my face and never completely cleaned my skin. There really aren't any things I don't like about this. It does what it claims, it feels good on my skin, the bottle is good for traveling, and bonus: it looks nice on the shelf. The fact that is removes eye make up without irritating my eyes is great. But maybe the name...milky jelly cleanser is an accurate description but kind of a weird name. Absolutely. 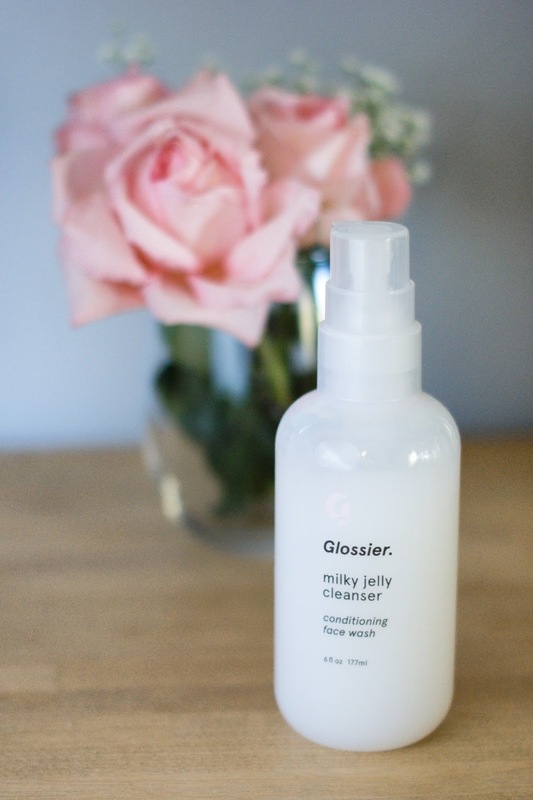 The Milky Jelly cleanser lives up to its description, and delivers on its promises.